BANGKOK: Thailand yesterday awaited the results of its first election since a 2014 coup, with the junta primed to retain its grip on power after a vote that saw its main rival diminished but vaulted a new pro-democracy force into the kingdom’s politics. Election officials delayed without explanation a full announcement of preliminary results as a blizzard of complaints mounted over apparent mistakes in the count and possible irregularities at the polls. Nearly 1.9 million votes had been invalidated with 93 percent of votes tallied, the Election Commission said. Earlier counts showed that in a handful of provinces more than half the ballots cast were invalidated. The EC pushed back a preliminary announcement on the number of constituency seats won by each party to late yesterday. “Please wait…this is Thailand, we are not like other countries who have an election one day and form a government the next,” said Jarungvith Phumma, EC secretary-general. He sidestepped questions over wildly inaccurate poll returns reported late Sunday in several constituencies, as down to “human error”. Despite that headstart, analysts had not expected the army-linked Phalang Pracharat party to win the popular vote, given anger at junta rule and the enduring popularity of Pheu Thai – the party of ex-premier Thaksin Shinawatra. 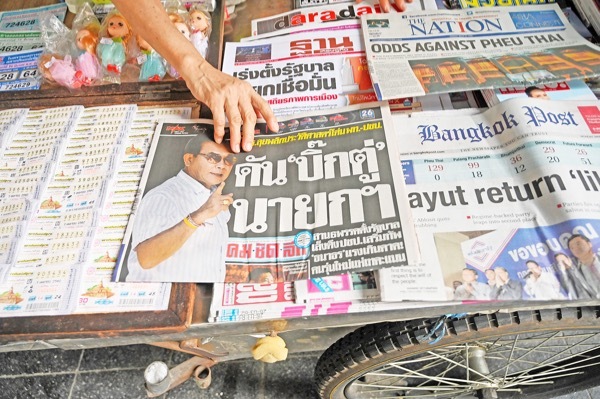 A vendor arranges newspapers at her newsstand in Bangkok yesterday, a day after Thailand’s general election. But preliminary figures showed Phalang Pracharat – with 2014 coup leader Prayut Chan-O-Cha as its candidate for prime minister – ahead in the popular vote. That is nearly half a million more votes than Pheu Thai, which nonetheless was confident yesterday it would still win the majority of lower house seats. As rivals scrambled to seize the political momentum, Pheu Thai’s prime ministerial candidate Sudarat Keyuraphan said her party had won the “mandate from the people” to form a government. If the numbers play out, Pheu Thai will have to build a pro-democracy coalition, lassoing in Future Forward – an upstart anti-junta party which has claimed over five million mainly youth votes. Thaksin, the self-exiled billionaire ex-cop turned-Thai premier, who is at the crux of Thailand’s political breakdown, reached out to shocked supporters in the pro-democracy camp as the results tipped against Pheu Thai. “As long as we still have breath, we can not give up,” he said in a Facebook post yesterday. 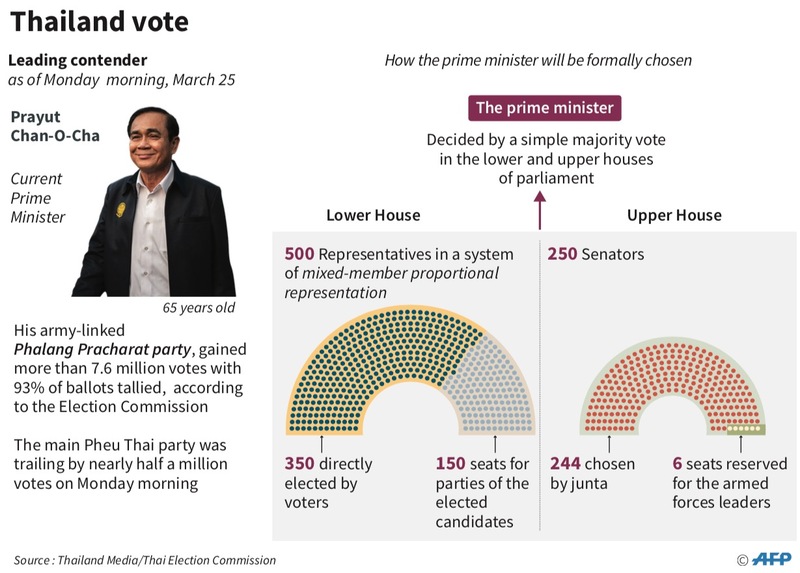 General Prayut’s party appears set to get close to the 126 lower house seats it needs to secure a parliamentary majority, in combination with the 250-seat upper house Senate that is appointed by the junta. “Every party has the right to gather 251 seats [to form a government],” Kobsak Pootrakool, spokesman of Phalang Pracharat told reporters. The rare statement came hours before polls opened. Thailand awaits results 0 out of 5 based on 0 ratings. 0 user reviews.